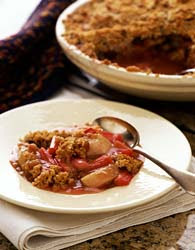 I do not care what Delia, Ainsley, or Gordon say, I make the BEST Rhubarb and Apple crumble in the world! I know, I know....it's hardly a challenge throwing together sugar, flour, and margarine on top of fruit but it's the way you use the cinnamon that makes it sooooo tasty! You're right. Also we like to have about twice as much crumble per pound of fruit as most recipes say. And we like about twice as much sugar in the crumble as the recipes say, not for sweetness, just for crunch. And yes, cinnamon makes all the difference.